Infographics are a great way to express complex data, information, knowledge, and relationships in an easy-to-see format. When looking for engaging blog post ideas, infographics are always a great way to make your blog posts more visual. The graphics leverage the human visual system’s ability to identify trends and patterns, and they’re great to use in your content marketing projects. 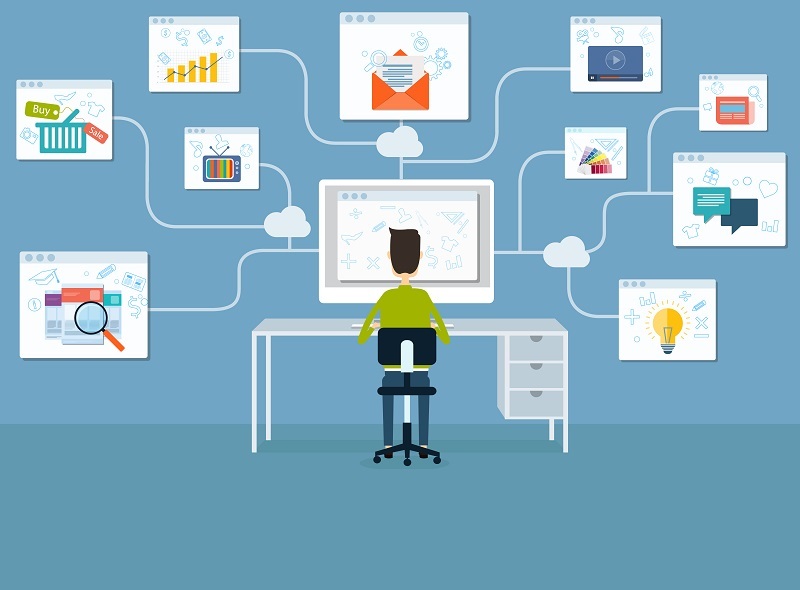 But you don’t need a degree in design to create infographics – you can do it online. 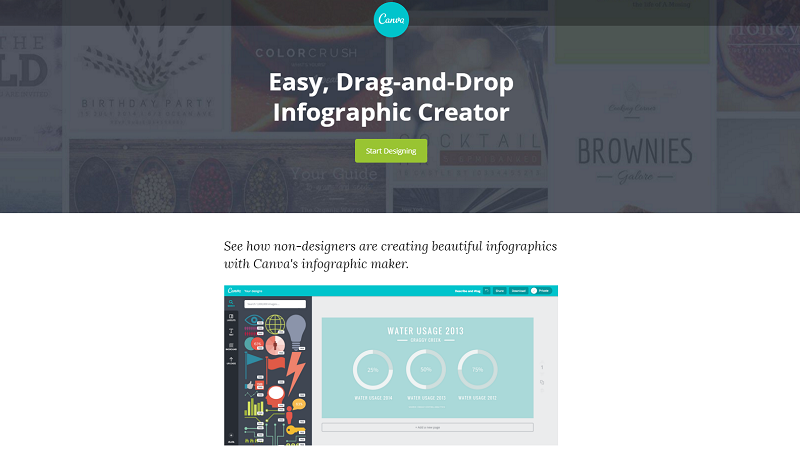 Canva is a simple and easy-to-use online tool for creating infographics with diagrams, photos, and icons. Its design is excellent, and it’s made for both designers and non-designers. Built-in tutorials guide you through the graphic creation process. 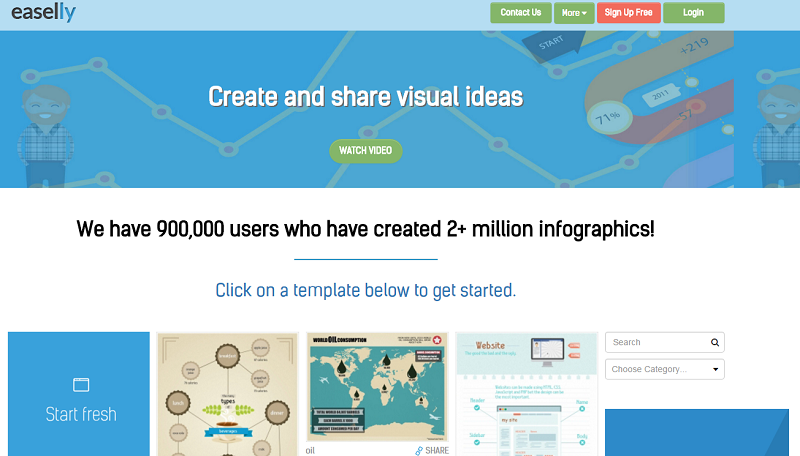 Features tools for creating not only infographics, but presentations, and social media graphics. Offers a dazzling array of tools, millions of stock images, photo filters, free icons and shapes, and hundreds of fonts. Excellent selection of predesigned templates. Limit of 15 pages to a presentation. Must state dimensions of the image before you start it, and you can’t change them afterwards. 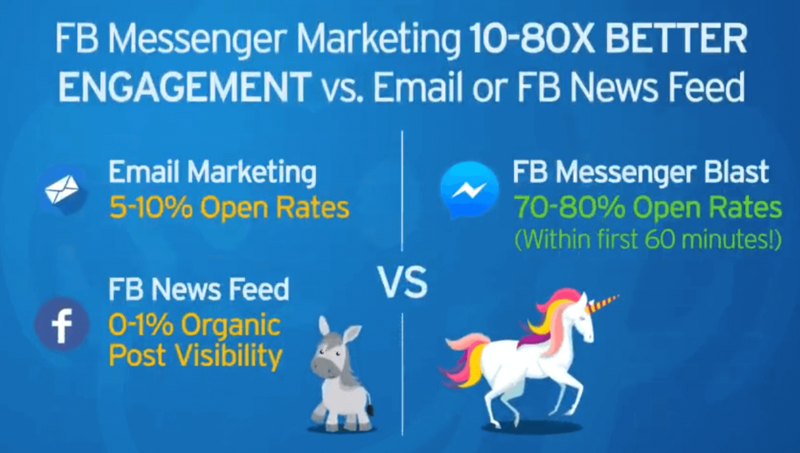 Could use more standard sizes for Facebook and Twitter posts. Designs do not always match what’s on the screen, so you must double-check them. Laggy when building large or multipage graphics. Stock photos are $1 each. Easel.ly is an excellent online tool for creating and sharing visual ideas online. Over 900,000 people have created more than 2 million infographics online, an impressive testimony to the ease of use and power of this infographic only tool. Features thousands of free infographic templates and design elements which you drag and drop when you create infographics. Extremely easy to use, well-suited for students, business owners, educators, and executives who need to express an idea in a visual form. Works well in all browsers. Al limited number of themes makes creating complex infographics more difficult. Doesn’t recognize special characters. You can spend a lot of time fiddling with your graphic, so it is best to sketch your idea out first before creating it. Easel.ly basic is Free. Features 60 free images and 10 fonts. Easel.ly Pro costs $3/month. Features thousands of free images, more than 50 fonts, and professional-grade templates. Can also upload your own fonts. 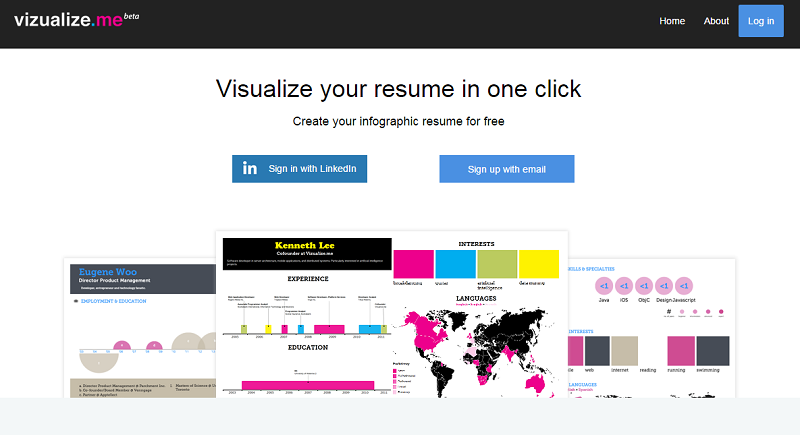 Vizualize.me is the infographic take on the traditional resume. It also provides other designs to create infographics, but its strong suit is the infographic resume. This is a great tool for creating a resume that stands out. You can use language maps, experience timelines, treemaps, and other design elements to create a visually compelling resume. Easy to use and create a resume design that pops. Works very well for creative disciplines and results-focused resumes. Won’t replace a traditional resume. If you have a poor job history, it will show up immediately in the graphical version. Not a good choice for executives or senior leaders. You can spend a lot of time fiddling with your graphic, so it is best to sketch your idea out first before creating it. Visme is another useful online tool that allows you to create infographics, ad banners, presentations, animations, and custom layouts. Its support for interactivity is excellent. You can publish new graphics quickly, and can insert data values directly into charts and graphs, and change them as needed. It features a large (and free) asset library, customizable assets, social media sharing, pre-loaded fonts, allows you to download your graphics, and makes it easy to share online by embedding your finished product. The layout is simple and direct. Easy-to-use editor. Thousands of free stock images from which to choose, including vector graphics and photos. A limited number of templates available in the free version. Best bet is to select the Standard edition. You can spend a lot of time fiddling with your graphic, so it is best to sketch your idea out first before creating it. Basic: Free. Three projects, 100MB storage, online publish, download JPG, limited charts and infographic widgets. Basic templates. Standard: $7/month. 15 projects, 250MB storage, online publish, download JPG, PNG, PDF, HTML5. Complete selection of charts and infographic widgets. Premium assets and templates. Complete: $16/month. Unlimited projects, 1GB storage, online publish, download JPG, PNG, PDF, HTML5. Complete selection of charts and infographic widgets. Premium assets and templates. Import from PowerPoint and Keynote. Premium support. Team License Plans are also available. Contact Visme for more information. 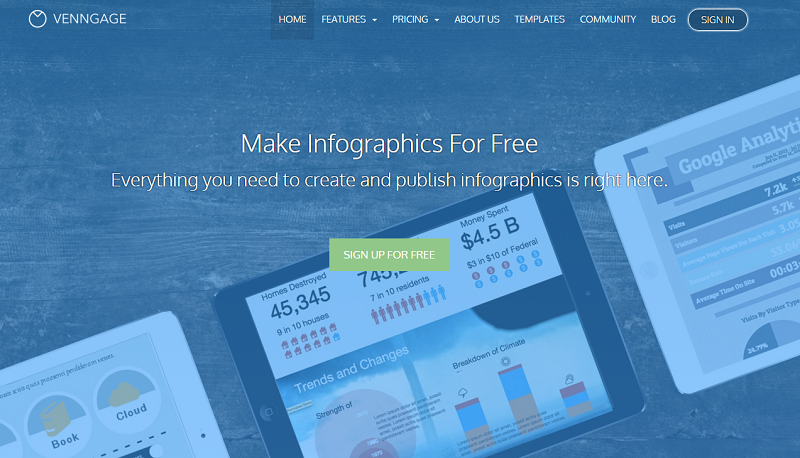 Venngage features hundreds of charts, maps, and icons from which you can create infographics. With hundreds of professionally designed templates, a vast library of icons and pictograms, and a complete set of data-driven charts and maps, you have everything you need at your fingertips to create infographics in a few minutes. Venngage also allows you to create reports, posters, and social media posts so you can tell your story visually. Available chart types include Line Charts, Smooth Line Charts, Area Line Charts, Pie Charts, Bar Charts, Multi-Column Bar Charts, Stacked Bar Charts, Scatterplot Charts, Bubble Charts, Stacked Bubble Charts, Multi-Series Charts, and Summary Stats. Completely web based. Easy to access and share infographics. 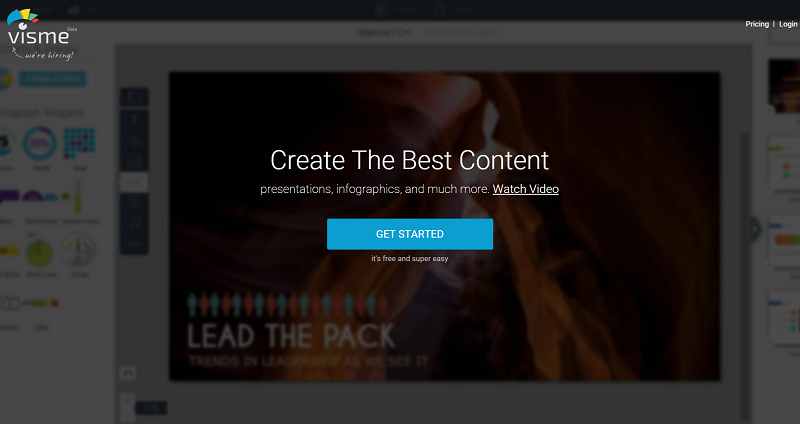 Venngage is always adding new templates, graphics, and features. Excellent pictogram selection. Supports spreadsheet data import. Branded infographics on the free edition, many limitations. Complex infographics get a little laggy, especially on slower connections. Difficult to reuse pieces of a working infographic to create another, new one. No set color themes; you must choose one for every element you add. You can spend a lot of time fiddling with your graphic, so it is best to sketch your idea out first before creating it. Premium. $15/month. Premium Themes & Templates, Premium Charts & Icons, Unlimited number of Infographics, Brand-free Infographics, Privacy Controls, Export to PDF & PNG. Venngage for Education: $29/month. Premium Features for all users, 35 Accounts for Students and Teachers, Class Sharing. As you can see, there are a whole host of convenient free tools available online to help you make fantastic infographics. Take your time and try out some of our tool above. If you are looking for any examples inspirations we use the infographic website where they combine all the best examples in one place. We can almost guarantee that you will see some positive results from making your blog posts more visually appealing through incorporating infographics into your content. Remember that infographics are a quick, visual way for the right people to consume your content quickly. 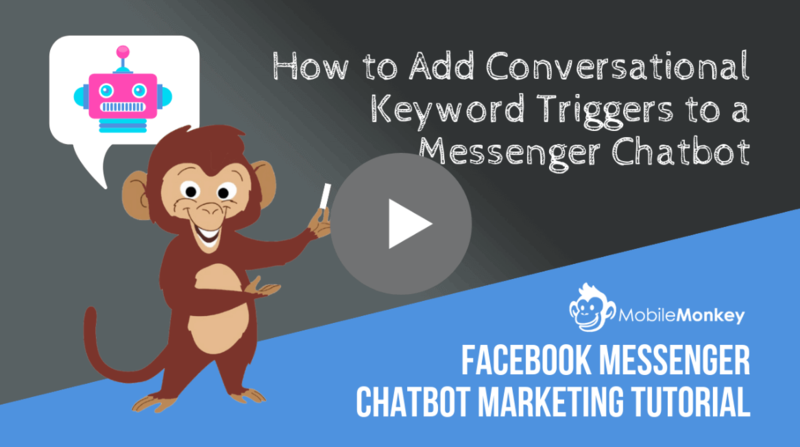 We hope that you found this post useful! Remember to leave a comment below if you have used any of the tools mentioned and let us know how you found them. You’re very welcome! We’re pleased to hear that you found this resource useful. We’re pleased to hear that our e-book is working out for you! We agree that there are lots of useful, actionable tips within the e-book. Yes, creating your own infographics instead of outsourcing can be a great way to cut costs if you’re creative! This is a really good idea if you’re creative, but I think I will leave any work like this to designers! I love writing, but design is not for me. But i’d be interested to see how the quality compares. P.S. I’m working my way through your website monetization guide as we speak – terrific stuff!